Millions of Americans enjoy coffee daily for a quick energy burst. Coffee is considered a remedy for short-term mental alertness and physical performance, and liver protection. However, drinking multiple cups of coffee each day can lead to caffeine addiction, insomnia and sleeplessness, adrenal fatigue, and mood disorders like anxiety. Interestingly, homeopathic coffea, or coffea cruda, has the complete opposite effect on the body. Basically, just as coffee winds up the nerves, coffea cruda will ease and unwind many stress-related symptoms. This follows the homeopathic principle of “like cures like.” This means that although coffee may have negative effects, when highly diluted, homeopathic coffea actually has important health benefits. For instance, coffee can lead to insomnia and sleep problems; however, homeopathic coffea is actually a key remedy for insomnia and sleeplessness. Coffea is also a popular homeopathic remedy for addictions, toothaches, headaches, fainting, labor pains, and more. 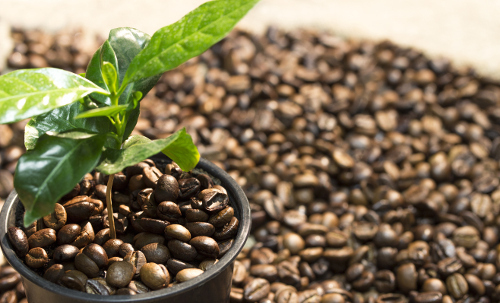 Read on to find out more about the homeopathic version of coffee, including its many uses and health benefits of coffea. Coffea cruda is made from ripe and roasted coffee beans that are macerated in alcohol for a minimum of five days before being filtered. After that, the liquid solution is repeatedly diluted and succussed to form the homeopathic remedy of coffea. The coffee shrub is a member of the Rubiaceae family, and it is native to tropical Asia and southern and tropical Africa. Supposedly, those from the Middle East nation of Yemen were the first to consume coffee. But according to other historical reports, Ethiopians should take the honor. In the 17th century, coffee was introduced to Europe, and later to the Eastern world and South America. In Ayurvedic medicine, coffee is used to treat for headaches when raw and for diarrhea when coffee beans are roasted. It must be understood that coffee has a long standing as being both helpful and harmful. The main active ingredient in coffee is caffeine. Excessive coffee and caffeine consumption can also lead to digestive disorders, hypertension, dehydration, and depletion of important nutrients like calcium, magnesium, vitamin C, potassium, zinc, and B vitamins. That being said, when used responsibly, coffee may actually be of great benefit to a person’s health. Research shows that coffee consumption may treat or prevent certain cancers, reduce the risk of liver diseases, decrease the risk of diabetes, and prevent heart diseases. Responsibly means using coffee as a short-term medicine rather than an every day, multiple times daily remedy. However, keep in mind that coffee must also be organic and made with clean, toxin-free water. In 1823, Dr. Johann Stapf demonstrated the efficacy of homeopathic coffea. Ever since, coffea cruda has been of great benefit to many people, especially those suffering from insomnia and sleeplessness. Although coffee is well known to lead to sleeplessness, homeopathy’s “like cures like” effect suggests that homeopathic coffea will relieve insomnia caused by an excited mind, fatigue, fright, wine, overenthusiasm, long journeys, a broken heart, menopause, or after pregnancy. Sleep is impossible for the typical patient, especially after 3 a.m., despite being overtired. Any sleep the person gets is interrupted by the slightest noise. It is helpful for people studying for exams or working very late, and cannot sleep due to too many racing thoughts. Coffea is also used to counteract the effects of caffeine taken too close to bedtime. Narcotics, sleeping in a draft, cold, intense smells, and strong emotions will also worsen symptoms. Warmth and lying down are thought to improve symptoms. Wakefulness in the early morning is also common with a desire to play. There is also scientific research that supports the efficacy of coffea cruda for insomnia and sleep problems. One study published in the journal Forschende Komplementarmedizin in 2010 found that homeopathic coffea cruda would improve mood in young adults with a history of coffee-induced insomnia. For the month-long study, 59 people between the ages of 18 and 31 received placebo pellets on night eight, and homeopathic pellets of coffea cruda or nux vomica in 30c doses on night 22. A sleep study conducted by the same authors, published in the journal Sleep Medicine in 2011, found that coffee cruda or nux vomica would significantly increase polysomnographic total sleep time and non-rapid eye movement sleep among insomniacs with coffee habits. This month-long study focused on 54 adults from 18 to 31 years of age. The authors also found that coffea cruda and nux vomica would alter short-term nonlinear dynamic parameters of slow wave sleep EEG (electroencephalographic) in 54 young college students with a history of coffee-related insomnia, according to research published in the journal Homeopathy in 2012. In the world of homeopathic remedies, the remedy profile is significant to help determine whether coffea cruda is the right fit for you. Excessive coffee consumption actually produces symptoms very similar of those being treated with coffea. Homeopaths often prescribe coffea for people with an overactive mind and thoughts that race uncontrollably. There is also restlessness and nervousness, and the person tends to experience overly ecstatic or excited states, perhaps due to a sudden shock, a series of events, or narcotics. They will suffer from exhausting highs and depressing lows, while their mind can’t seem to stay still and this causes suffering at times. The person often has trouble coping with bad news while feeling despair quite easily. Besides insomnia, other key health benefits of homeopathic coffea include treating headaches, toothaches, palpitations, fainting due to overexcitement, and flushing during menopause. It is also helpful for people with an over-stimulated nervous system, especially those that are sensitive and react strongly to touch and noise. It is also used for nervousness from drinking too much coffee, or coffee abuse in general. The following is further description on a few of the other key health benefits of coffea. Coffea is well indicated for headaches experienced on one side of the head. The pain is sharp and feels like a nail is being driven into the head. The pain often sets in after waking, and it can stay with the person throughout the entire day. Coffea is particularly useful for headaches triggered by tension or stress. It is also used for neuralgia or extreme head pain, or migraines worsened by noise or music. It is also used for headaches caused by sudden emotions, thinking, talking, or mental exertion. Pain is also worsened from motion, fresh air, drinking coffee, and during the afternoon or at night. Pressure on the head with a cold compress and lying or sitting still in darkness will improve symptoms. Coffea is also useful for toothaches that shoot downward from the teeth to the tips of the fingers. Tooth pain worsens from heat, hot foods, and from menstruation, but they improve from putting ice or cold water on the affected area. The tooth pain is so bad that it makes sleeping quite difficult. Coffea is used for labor pains with oversensitivity to pain. The contractions will seem so painful that they cause involuntary crying and screaming. There will also be restlessness and nervousness between contractions, and sucking ice will temporarily improve symptoms. Where do you find homeopathic coffea cruda? I’ll give you a hint: It’s not the coffee shop. It can be found in the supplement section of most health food stores. You can also get coffea cruda from your qualified homeopath if they have determined the remedy is the best fit for your mental, emotional, and physical symptoms. Your homeopath can also help recommend the best dosage based on your symptoms. As mentioned, coffea cruda is most often prescribed for insomnia, sleep issues, overexcitement, headaches, toothaches, and labor pains. Lockie, A., Encyclopedia of Homeopathy: The Definitive Home Reference Guide to Homeopathic Remedies and Treatments for Common Ailments (New York: DK Publishing, Inc., 2000), 50, 232-233, 24-245, 248-249, 262-263, 275. Hershoff, A., N.D., Homeopathic Remedies: A Quick and Easy Guide to Common Disorders and Their Homeopathic Treatments (New York: Penguin Putnam Inc., 1999), 146, 200-201. “Homeopathy Coffea Coffee,” Herbs2000.com; http://www.herbs2000.com/homeopathy/coffea.htm, last accessed June 19, 2017. Boericke, W., “Homeopathic Materia Medica,” Homeo Int; http://www.homeoint.org/books/boericmm/c/coff.htm, last accessed June 19, 2017. “Coffea Cruda,” Homeopathic Remedies; http://www.homeopathicremediesblog.com/remedies/coffea-cruda/, last accessed June 19, 2017. Brooks, A.J., et al., “Effects of homeopathic medicines on mood of adults with histories of coffee-related insomnia,” Forsch Komplementmed, October 2010; 17(5): 250-257, doi: 10.10.1159/000320952. Bell, I.R., et al., “Effects of Homeopathic Medicines on Polysomnographic Sleep of Young Adults with Histories of Coffee-Related Insomnia,” Sleep Medicine, May 2011; 12(5): 505-511, doi: 10.1016/j.sleep.2010.03.013.